This product recognises an epitope within the N-terminal region of glycine receptor alpha 1 and alpha 2 subunits. Rat brain lysate, rat spinal cord lysate. For long term storage the addition of 0.09% sodium azide is recommended. Our Abpromise guarantee covers the use of ab23809 in the following tested applications. WB 1/1000. Detects a band of approximately 48 kDa. ICC/IF Use at an assay dependent concentration. Used at a dilution of 1/1000 for overnight incubation on rat cells (see Abreview submitted by Johana Trojanova). Glycine receptors are members of the ligand-gated ion channel superfamily, which mediate fast inhibitory neurotransmission. The receptors are pentameric membrane proteins which form chloride channels. Binding of glycine to its receptor produces an increase in chloride conductance and membrane hyperpolarisation. Four genes encoding glycine receptor alpha subunits have been identified, together with a single beta polypeptide. Each subunit consists of a large extracellular N-terminal region, four transmembrane domains, and a large cytoplasmic domain. ab23809 at a 1/1000 dilution staining rat brain stem cells(medial nucleus of trapezoid body) by ICC/IF. The cells were fixed with paraformaldehyde and incubated with the antibody for 18 hours. 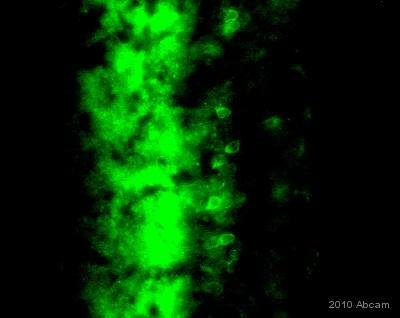 An Alexa Fluor ® 488 donkey anti-rabbit antibody was used as the secondary. ab23809 staining Glycin Receptor alpha1 + alpha 2 in Mouse retinal tissue sections by Immunohistochemistry (IHC-Fr - frozen sections). Tissue was fixed with paraformaldehyde and blocked with 5% serum for 1 hour at 20°C. Samples were incubated with primary antibody (1/400 in PBST) for 12 hours at 4°C. An Alexa Fluor®488-conjugated Donkey anti-rabbit polyclonal (1/1000) was used as the secondary antibody. Publishing research using ab23809? Please let us know so that we can cite the reference in this datasheet. Please see the answers below, but , anyway, the customer has already ordered additional vial, since she understood that she should store the ab at -20C. 1. How was the antibody aliquotted? Was it diluted at all prior to aliquoting? no What was the size of the aliquots? 10ul if I'm not mistaken. We would recommend storing the antibody at -20 degrees C, however, I was trying to identify if any other factor which could be contributing to the loss in activity. From the information the customer has provided it seems that it is most likely the storage temperature that made the difference. However, if they continue to observe the same problems when storing at -20 please do let me know and we will try to help as best we can. If you have any further questions or requests please do not hesitate to contact us again. Inquiry: The customer used ab23809 upon delivery and it worked well in WB, but following the aliquoting and the storage at -80C the antibody stopped working in the same experiment sytem with the same reagents. It looks like the antibody lost its activity. Please advise. Have a nice day. I am sorry to hear you are experiencing difficulties with one of our products. We take product complaints very seriously, and investigate every product that we feel may not be performing correctly. 1. How was the antibody aliquotted? Was it diluted at all prior to aliquoting? What was the size of the aliquots? 2. How was the loss in activity observed, was no band seen or just a less strong one? 3. Could you provide me with images of the blots obtained? This information will allow me to investigate this case internally and initiate additional testing where necessary. We do advise on the datasheet of this antibody that it should be stored at -20 degrees, not -80. This may have contributed to the loss in activity. BATCH NUMBER -- NOT SPECIFIED -- ORDER NUMBER -- NOT SPECIFIED -- DESCRIPTION OF THE PROBLEM No immunoreactivity was detected at 1:250 dilution of primary antibody (Ab23809) in the lateral superior olivary nucleus (LSO) and medial nucleus of trapezoid body (MNTB) of wild type mouse (+/+). SAMPLE Brain tissues of C57bl/6 mouse species were used. 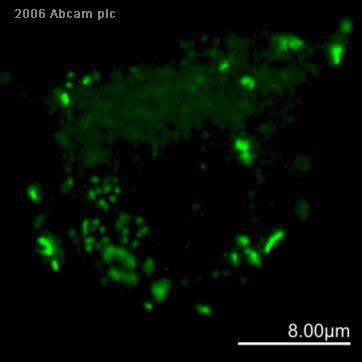 PRIMARY ANTIBODY Manufacture: Abcam Company Species reactivity: rat Diluent: Blocking buffer: PBS (pH 7.4) containing 1% bovine serum albumin, 0.3% Triton X-100 and 1% normal Horse Serum Dilution: 1: 250 Brain tissues were incubated during 24-48 hr in Ab23809 (diluted 1:250 in blocking buffer) at cold room (4℃) with agitation on the orbital shaker Incubation time: 24-48 hr Wash step: sections are washed three times in PBS DETECTION METHOD DAB POSITIVE AND NEGATIVE CONTROLS USED We didn’t use the positive control because we couldn’t get the control peptides. We just performed the negative control in our experiment. ANTIBODY STORAGE CONDITIONS at -20°C. FIXATION OF SAMPLE We fixed brain tissues in 4% paraformaldehyde in 0.1M phosphate buffer solution (pH7.2). ANTIGEN RETRIEVAL We don’t’ need to antigen retrieval step because we use fresh cryo-cut tissues. PERMEABILIZATION STEP We don’t perform this step because we use 0.3% Triton X-100 in primary or secondary antibody incubation step. Furthermore, in the primary antibody incubation step, we agitate the immunostaining jar properly on the orbital shaker to fortify the permeabilization of antibody BLOCKING CONDITIONS Blocking buffer: PBS (pH 7.4) containing 1% bovine serum albumin, 0.3% Triton X-100 and 1% normal Horse Serum The sections of mouse brain were washed three times in PBS and blocked in blocking buffer for 1 hour SECONDARY ANTIBODY Manufacture: [another company] Species reactivity: rabbit Diluent: PBS (pH 7.4) containing 0.3% Triton X-100 Dilution: 1: 200 Incubation time: 1.5 hr Wash step: sections are washed three times in PBS HOW MANY TIMES HAVE YOU TRIED THE APPLICATION? 3 HAVE YOU RUN A "NO PRIMARY" CONTROL? No DO YOU OBTAIN THE SAME RESULTS EVERY TIME? Yes WHAT STEPS HAVE YOU ALTERED? I never alter any steps in each trial. I am sorry to hear your customer is having a problem with ab23809. Thank you for providing the customer's protocol as well as an image, this helped me understand the problem very easily. The image shows positive staining with some sections ("previous IHC staining result for glycine receptor alpha 1 and 2") , can you please clarify if those were done from a previous lot of the antibody, and if so what lot it was? The customer's protocol is excellent and if this is the first time the customer has used the antibody, I fear that the reason for the lack of signal is that the antibody does not work on perfusion fixed tissue, which I understand is the method used by your customer. The epitope may be too fixed and therefore the antibody cannot recognize it. The antibody works well in fresh frozen sections however so I would recommend to switch to this method of immunohistochemistry. It would also be worth checking that the secondary antibody works with other primary antibodies, to rule out that this is the reason for the lack of signal. Please let me know if this helps and do not hesitate to contact us for further advice. Thank you for your enquiry. Your approach is very much akin to the approach made for frozen sections. I would therefore recommend that you perform this standard approach omitting antigen retrieval. If you decide to go ahead and purchase this product, we encourage you to submit an Abreview via the online product datasheet. We always encourage customers to send their results back to us, whether positive or negative, and make all product information available to researchers. To find out more about our Abreview system, please see the following URL; https://www.abcam.com/abreviews I hope this information helps, please do not hesitate to contact us if you need any more advice or information.